Looking for a multimedia math program with an emphasis on conceptual understanding that will cover ALL of Algebra in 2 years (even pre-Algebra) at a do-able pace and without any mindless busywork? 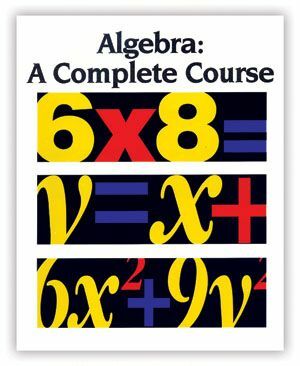 VideoText Interactive recently gave me the opportunity to review Algebra: A Complete Course with my math-phobic 8th grader…let’s see how it went. Recommended for grades 8 & up, although younger children might successfully use this program---Is your child ready? 3-year online subscription for up to 2 students. Also available on DVDs for $529. Please see the website for various purchasing options. There are also quizzes to check for mastery after most lessons. Each quiz or test has an “A” and a “B” version in case you need to reteach and test again. Is it really a complete course in Algebra? You can download the scope and sequence for VT’s Algebra course here. VideoText Interactive’s Algebra program covers the topics covered in pre-Algebra, Algebra I, and Algebra II in a logical course progression, beginning with understanding the “grammar” of mathematical language and working through various degrees of relationship (Algebra is all about relationships, after all). The program does not divide out Algebra I from Algebra II, but treats the whole in a logical sequence. If that sounds like Chinese, take a look at VT’s rationale for their scope and sequence here. Here’s a further explanation of the delineation of Algebra I and II in the FAQs. The program is divided up into 6 modules (names A-F) and has a total of 10 units. Module A covers pre-Algebra work and that is what my 8th grader is working on now. Can it really be done in only 2 years? Suggestions for pacing this course over 1 year, 2 years, or 3 years are provided on the site. Each lesson can be completed in 1 day (assuming no issues with understanding), taking the lesson’s quiz the next day. With 176 lessons in all, completing the whole program is very do-able in 2 years. An older student playing catch-up could conceivably do a lesson a day and complete the course in about a year. A younger student could work at a slower pace. All of the course materials are accessed online. You will have both a student account and a parent account with separate log-ins. Things like the quizzes can only be accessed in the parent account. As you can see, there’s a link for each lesson. There is no “bookmark” or indicator to show which lessons have been completed. While my son does have a weekly assignment sheet that I type up for him which tells him what to do next, it would be really nice if there was some way the program could indicate which parts have been viewed from this menu ( a check mark, perhaps, or a different color for the link once it has been “visited”). My son would often sit down at the computer and forget which lesson it was that he needed to do next, leading him to go get his notebook. There’s a dropdown menu at the top right where you can “jump to” another lesson. I particularly like the message that reminds my son to take the previous quiz before starting this lesson. There’s also a Video Lesson Reminder which reminds your child to read and familiarize himself with the objective of the lesson before he watches the video. Here’s a screenshot of the video. Notice that the page tells you the running time and gives the objective of the lesson. The gentleman you see pictured here has appeared in all the videos we have watched so far. He has a pleasant, clear speaking voice. Visuals are animated and are similar to the style you see here. You can see samples of videos from VideoText Interactive’s Algebra here. After watching the video, your child can access the Course Notes, Work Text and Solutions Manual directly from that screen in the left sidebar. A child who works well from the computer could do his work in a notebook, copying the problems from the screen. My child works better with paper in front of him. I found that it was easiest for me to simply print all the printable Unit 1 materials I felt we would need before getting started---this saves me a lot of back and forth printing today’s Work Text or quiz. I printed the Course Notes, the Work Text and the Quiz As from the parent account for the unit (I can always go back and print any Quiz Bs if needed). I also downloaded (but did not print) the Solutions Manual and answer key for the quizzes, which saves me the trouble of logging in just to check answers. In fact, as the system doesn’t do any actual record keeping (there are “progress checklists” provided to print and record your child’s progress), I don’t anticipate having to log into my parent account at all except to prepare for each new Unit. Help, I’m Math Stupid, can my child still use this program? Yep. It’s been many moons since I studied Algebra. Please don’t ask me to explain polynomials. But I don’t have to figure it out on my own! The interactive video component teaches the material. If your child works well independently, you can have him watch the video on his own, but you can also watch the video with him. VideoText recommends frequently pausing the video to think out the answers to questions that are asked and so forth. This is the “interactive” component. We found that technique to not be very effective for my son if he was viewing the video on his own. Put it down to inhibition---it feels stupid to talk to a video screen by yourself. And feeling awkward is a common issue for teens, so I suspect he’s not the only 13-year-old who would feel funny talking to the video. He also felt that at times the video moved to0 quickly for him to hit “pause” before the answer was given. When we watched a video together, however, I would pause it and we could discuss it, which did seem much more natural. After watching the video, your child can refer to the Course Notes to teach the material to you---there’s no better way to “own” knowledge than to share it with someone else by teaching it to them. Finally, he can go over the material in the Work Text and try the practice problems. VideoText recommends having your child complete the odds or evens (save the extra problems in case you need extra reinforcement or to reteach). You can use the Solutions Manual to check over his work or have him do it. If he has errors, you point out which problems are incorrect and see if he can find his mistakes and correct them on his own. If he can’t figure it out, the Solutions Manual contains complete solutions, not just the final answer, which makes it easy to see where he went wrong. Most of the lessons have an accompanying quiz (both an A and a B version) for demonstrating mastery, although there are some topics that are divided up into multiple lessons and so the quiz covers those lessons. For instance, in Part B of Unit 1, Lesson 2 (Fraction Forms and Decimals Forms) and Lesson 3 (Changing Fraction Forms to Decimal Forms) are covered on the same quiz. What if your child seems to do fine on the practice problems, but takes the quiz and flubs it totally? Hey, it happens. In fact, it happened to my kid. The topic was converting repeating decimals into fractions. Ugh, you say, now what? One of the beauties of the VideoText’s program is that I can learn from it just was well as my son can. I can sit and watch the video with him or read the Work Text and when he can’t remember how to do something, we can pull out a whiteboard and work the examples together. Video Text also offers a free, unlimited helpline to original purchasers of the program. If you run into a brick wall, they have trained instructors to help you find your way. We didn’t need to use the helpline in this instance, but I’m happy to know it’s there if I need it. We’re still using it, and that’s a good sign. David is using the 2-year schedule which has him doing a new lesson every other day. On his “off” days, he does the quiz for the previous lesson (if there is one) and works on another math program that covers “non-Algebraic” topics (like volume conversions and such). He has finished the first half of Unit 1, which is divided into 2 parts. He’s completed parts A and B and is working on C. Most of Unit 1 covers topics that he’s seen before. So far, he likes it except when he runs into a difficulty, like converting repeating decimals into fractions. This was a topic he had never seen before---he was familiar with repeating decimals, but this particular procedure was a whole new animal to him. The amount of practice given for topics that he has already been exposed to and is just reviewing this time around seems about right. This is a kid that hates doing unnecessary or pointless work, so he likes the brevity of the worksheets. BUT, we have found that the practice given for brand new topics is sometimes insufficient. In the case of the repeating decimals, I had to reteach the material using the Work Text, have him do the evens, and then give him periodic practice problems (1 a day over the course of several days) to ensure mastery. This may be less of an issue as we get further into the program. Since the first unit covers pre-Algebra, which touches on many different topics (and they are not all directly related to one another), there may be less of the building upon previous topics that you will get with later units. I’m hoping, anyway. It seemed that the quizzes really don’t seem to touch on topics from previous lessons unless it was directly related to the current lesson. It’s not necessary, after all, to remember how to convert a repeating decimal into a fraction in order to convert a decimal into a percent. I love that the Solution Manual and answer key for the quizzes give complete solutions to the problems. It really does make it easier for me to see what’s going on when my son gets an answer wrong. Unfortunately, the answers in the Solution Manual are in mice type. It’s really hard to read some of the exponents and such, even when magnified on the computer screen. Even my son, who has near perfect eyesight, had trouble reading it. I think it would be great if this file could be re-done in much larger type. My son also suggests that the Work Text itself be reworked so that students have plenty of room to work out their problems directly on the worksheets. The current format really does make it necessary to write on another sheet of paper in order to show your work. If I give him the problems on a sheet of blank paper, he shows the work. With the Work Text, he feels compelled to do the work in his head so he didn’t have to try to cram it into a tiny space or go get another sheet of paper. A simple solution would be to have your child do his work in a spiral or quad ruled notebook---but for those who sometimes have difficulty copying accurately, it would be nice to have more room on the worksheets themselves (and it would be one less notebook to cart around). In terms of instruction, we like the videos. My kid is highly visual and the simple animations stick much better than reading the words on a page. Sometimes I watch the videos with him, but generally I don’t (I’ve got two other kids to teach math to). When I have watched, I’ve been impressed with the instruction packed into such a short video. VideoText Algebra works best for us if I go over the examples in the Work Text with him after he watches the video. This makes the program more hands-on and provides him with the immediate feedback he needs in order to discuss and understand the concepts. And occasionally I am able to give him a different perspective that he didn’t quite “get” from the video. VideoText Interactive’s Algebra: A Complete Course seems to be a well-built program. Like most things, it may need some tweaking here and there to get the most out of it for my particular student, but I feel confident that it will provide me with the tools I need to give him a solid background in Algebra.